Sen. Bernie Sanders addresses supporters Thursday night from Burlington. Sen. Bernie Sanders (I-Vt.) isn't ready to call it quits. In an online address Thursday evening, the senator from Vermont pledged to continue fighting for a "political revolution" — through next month's Democratic National Convention and beyond. "This campaign has never been about any single candidate," he said. "It has always been about transforming America." 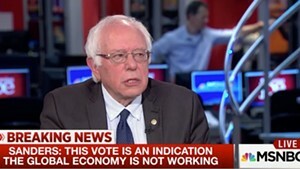 In a 23-minute speech, broadcast live from a television studio in Burlington's Old North End, Sanders did not say he would continue challenging former secretary of state Hillary Clinton for the Democratic nomination. But neither did he say the words "concede," "suspend" or "endorse." Rather, he seemed to be holding out for specific concessions. "It is no secret that Secretary Clinton and I have strong disagreements on some very, very important issues. It is also true that our views are quite close on others," he said. "I look forward, in the coming weeks, to continued discussions between the two campaigns to make certain that your voices are heard and that the Democratic Party passes the most progressive platform in its history — and that Democrats actually fight for that agenda." While Sanders declined to offer his full support to Clinton, he pledged again to do all he could to prevent presumptive Republican nominee Donald Trump from assuming the presidency. "The major political task that together we face in the next five months is to make certain that Donald Trump is defeated and defeated badly," he said. "And I personally intend to begin my role in that process in a very short period of time." 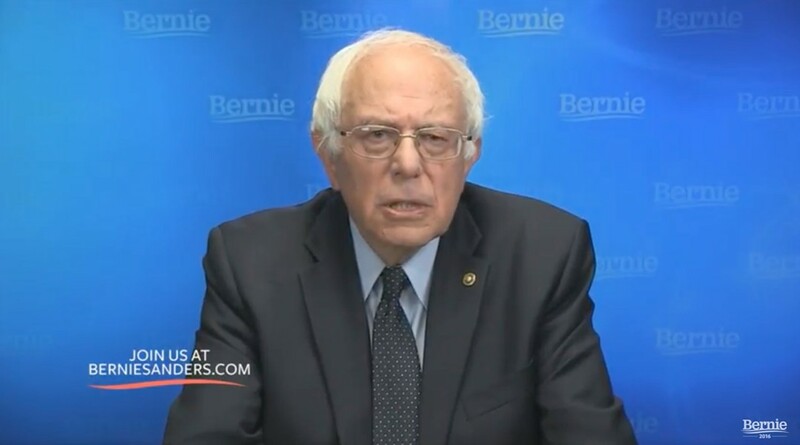 Sanders continued to criticize the leadership of the Democratic Party, which he accused of catering to the wishes of special-interest groups and "turn[ing] its back on dozens of states." "The Democratic Party needs a 50-state strategy," he said. "We may not win in every state tomorrow but we will never win unless we recruit good candidates and develop organizations that can compete effectively in the future. We must provide resources to those states which have so long been ignored." Sanders was short on specifics about how he would keep his "political revolution" alive. He unveiled no new organizational structure to replace his presidential campaign, and he did not say precisely what he would do to support the movement. But he argued that the key to making lasting change was to "start engaging at the local and state level in an unprecedented way." The former mayor of Burlington encouraged his supporters to run for school board, city council and other local offices. And he promoted a new webpage for those willing to run or volunteer. "I have no doubt that with the energy and enthusiasm our campaign has shown that we can win significant numbers of local and state elections if people are prepared to become involved," he said. Near the end of his remarks, Sanders reflected on the campaign he wasn't ready to declare over. "My hope is that when future historians look back and describe how our country moved forward into reversing the drift toward oligarchy — and how we moved forward in creating a government which represents all the people and not just the few — that they will note that, to a significant degree, that effort began with the political revolution of 2016," he said.